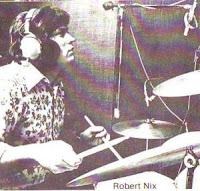 Robert Nix, who played with such greats as Roy Orbison and was the founding drummer of the Atlanta Rhythm Section, passed away in Memphis, TN on Sunday at the age of 67. While no offical cause of death has been announced, his brother told The Florida Times-Union that he had suffered from diabetes and had been hospitalized for a month after an operation. From Rodney Justo and ARS, Our thoughts today are with Robert Nix, our founding drummer, who passed away this morning. Nix had played with Roy Orbison's backing band, the Candymen, along with singer Rodney Justo and keyboard player Dean Daughtry. A fourth member of the group, Buddy Buie, who was also a member of the Classics IV, brought the musicians back together to do studio work at Doraville, Georgia's Studio One. Two additional musicians, guitarist Barry Bailey and bassist Paul Goddard were added to the group and the Atlanta Rhythm Section was born. The group continued to play on other artists records three-to-four day a week and work on their own material in their spare time, eventually completing enough tracks for a demo that got them signed to MCA/Decca for two albums. Their first, self titled album, came and went and Justo decided to leave the group, to be replaced by Ronnie Hammond and setting the lineup that would record their next six albums. Their third album (and first for Polydor), 1974's Third Annual Pipe Dream, finally started to break the band into the national spotlight as the single Doraville cracked the U.S. top forty. It would be three more albums, though, until they really made it big with their 1976 album, A Rock and Roll Alternative and it's hit single So Into You (1977/#7 Pop/#11 Adult Contemporary). They followed with 1978's Champagne Jam and their second top ten hit, Imaginary Lover (1978/#7 Pop/#20 Adult Contemporary). It was shortly after their greatest success that Nix and Buie had a falling out and Robert left the band to be replaced by Roy Yeager. Nix went on to do session work for the rest of his professional career. In addition to his work in the early-70's with ARS, Nix was a close friend with Lynyrd Skynyrd's Ronnie Van Zandt and sat in on drums on the group's classic track Tuesday's Gone from their debut album. When Van Zandt was killed in 1977, Nix purchased his Florida home. Nix is in both the Florida and Georgia Music Halls of Fame. He is survived by his wife, two daughters and a son.